Save the Date for the Annual Vest Pocket Holiday Mixer on December 3rd! Save the Date! 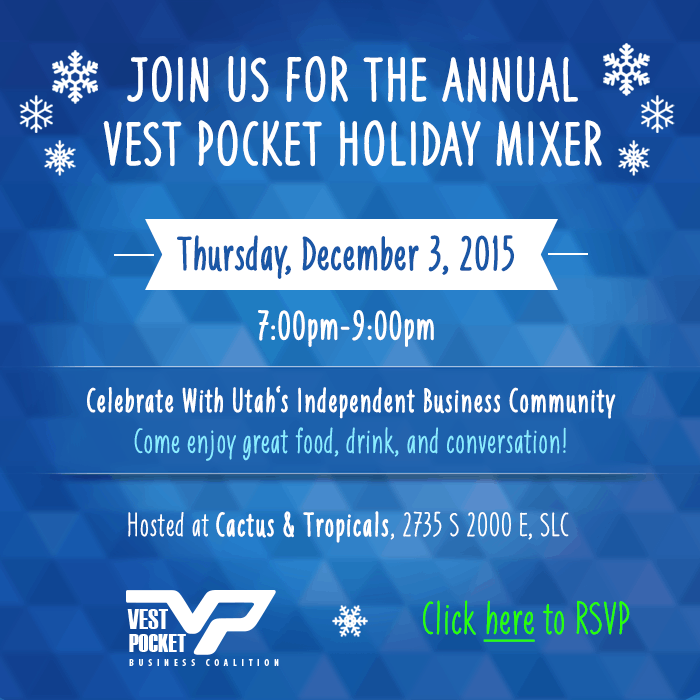 The Annual Vest Pocket Business Coalition Holiday Mixer is coming up on Thursday, December 3rd, from 7-9pm! Come enjoy great food, drink, and conversation with other members of Utah’s Independent Business Community. Join us to celebrate the season at Cactus and Tropicals, 2735 S. 2000 E., SLC on Thursday, Dec. 3.
https://utahindependentbusiness.org/wp-content/uploads/2015/11/Vest-Pocket-Holiday-2015-xsmall.png 100 100 dburton_90067so9 https://utahindependentbusiness.org/wp-content/uploads/2018/09/UIBC-logo-rev.png dburton_90067so92015-11-17 00:03:442015-11-18 19:50:13Save the Date for the Annual Vest Pocket Holiday Mixer on December 3rd!